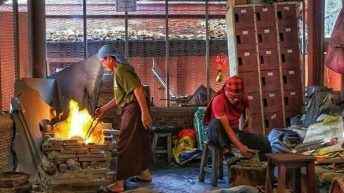 This is one of the reports in a series produced by Bulatlat.com with the Asia-Pacific Forum on Women, Law and Development (APWLD) Media Fellowship. The series aims to report on linkages between gender, ecological conflicts and climate change. 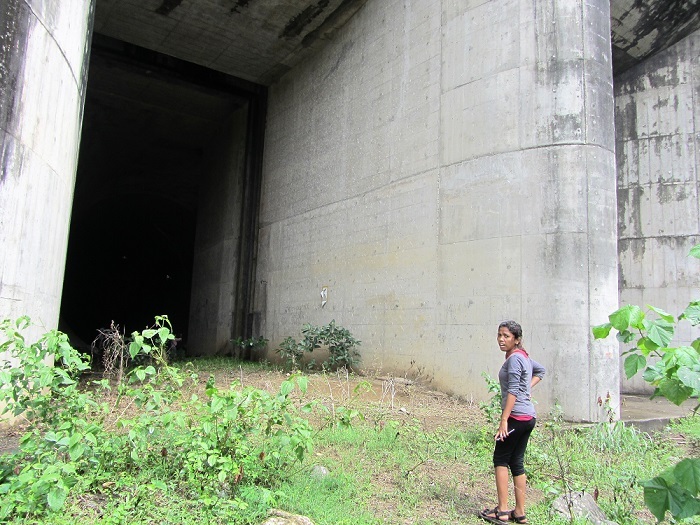 MANILA — Two proofs stand out today showing how long and how determined the people of Sierra Madre have defended its rivers from private mega-dam projects. 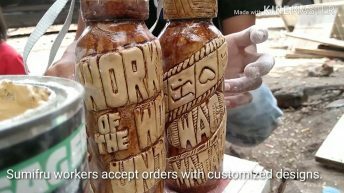 One, over the years, they have generated what’s shaping up into a soundtrack of the indigenous people’s defense of the rivers and forested ancestral lands in Rizal and Quezon. Two, they have leaders and organizers of environmental defenders today who were youth activists or kids going with their parents in protest actions of the past. A Dumagat spokesperson of Imaset, Wilma Quierrez, is one of such leaders. 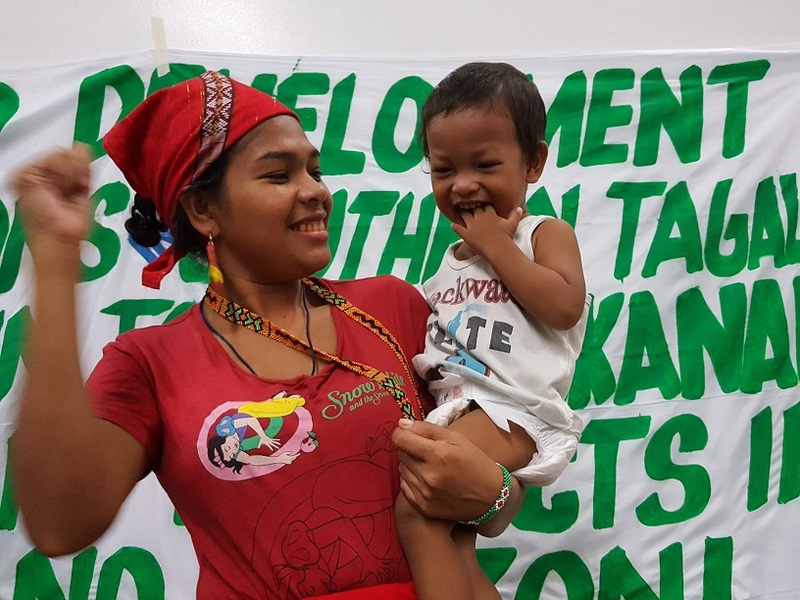 As early as when she was six months old, her mother was organizing the Dumagat seeking to stop the Laiban dam project then of the Marcos administration. Wilma grew up watching her mother, Marilyn Quierrez, working actively for the cause. She is grateful to her mother. “She raised me mindful of the plight of the indigenous people, of our right to self-determination, and inextricably linked to that, the need to protect the environment.” As a child she had gone to rallies with her mother. With her are other second-generation defenders of the environment, like Lodima Doroteo, who recalls having joined protests with her grandfather in the 90s. She is now in her early 20s and also active in continuing the Dumagat elders’ defense of the river and forests. 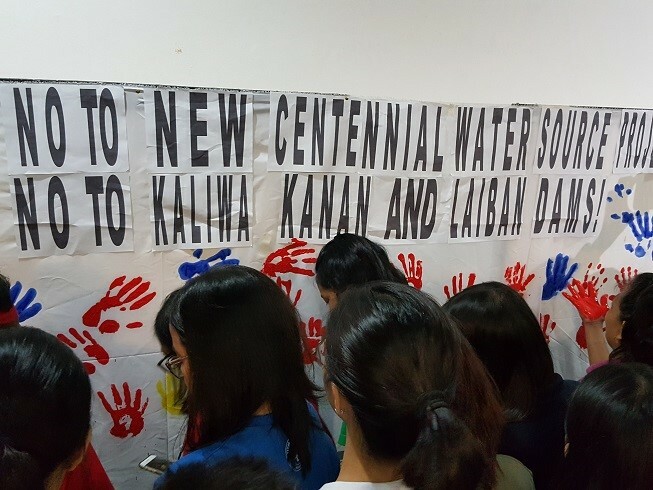 The children of Nicanor delos Santos are also actively uniting calls to continue defending the rivers from the renewed drive to dam big parts of it under different names. 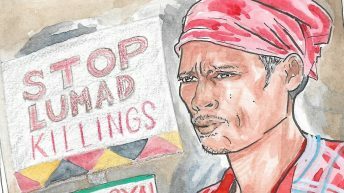 Nicanor delos Santos was the Dumagat leading the tribe’s opposition to Laiban Dam when he was murdered at the beginning of former President Gloria Macapagal-Arroyo’s term. 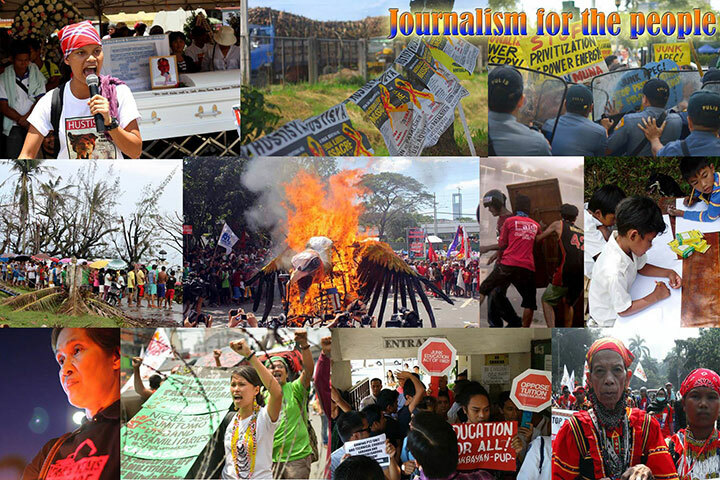 Delos Santos’ murder did not stop the struggle which eventually succeeded in stopping the project again. Wilma herself seems to be passing on the tradition to her children. A breastfeeding mom, wherever she goes her youngest son is in tow. Her son goes with her in forum, mass delegation and lobbying, street rallies, or conferences. Wilma could be seen carrying her son sometimes even on stage when she’s addressing the public. Wilma’s mother passed away 10 years ago at the age of 48. “It’s very hard to no longer have your mother with you,” the daughter admits. She’s intent on continuing what her mother helped her realize needs doing. She’s being like her, she said. While active at campaigns for saving the river and the forest, Wilma’s mother had also worked to bring food to the table. Like her, Wilma is also a farmer. She works the land with her husband, and that they are both raising their children consciously avoiding the feudal mindset – they are seeking equality and both strive to respect and support each other at work, at home and in the struggle against dislocation from their ancestral land. 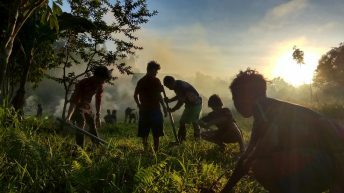 The need to protect the forest and its river as well as their right to ancestral domain and self-determination has prompted both the Dumagat men and women to act. They also seem to have arrived at a setup they can best work with. The men handle the heavier work or stay longer in the fields; the women who also work at the field also find the time not just to attend to their homes, children and selling or storing their produce, but to also attend to building community, unity and spreading the news with other Dumagat, Remontado and others who would be adversely affected by the dam projects. 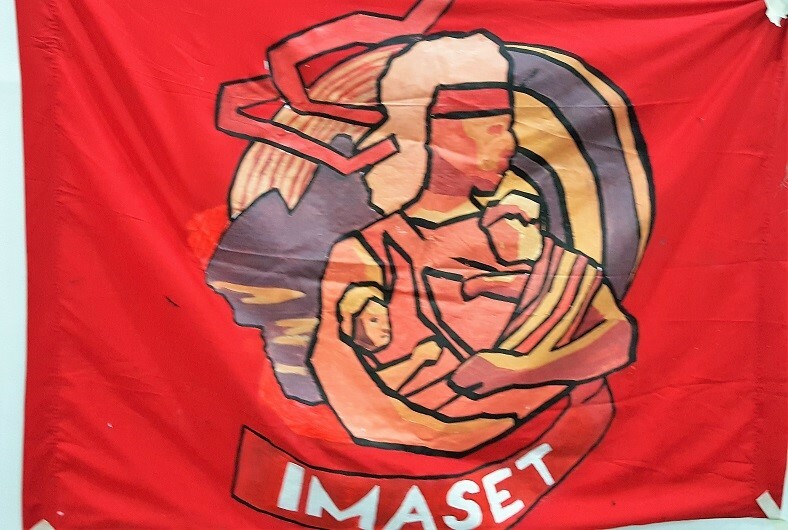 This is the flag of Imaset, the Dumagat women’s organization working to save the environment and the Sierra Madre from destructive projects. Last August 3 to 4, Wilma and other Dumagat women established Imaset, the Dumagat and Remontado women’s assembly. 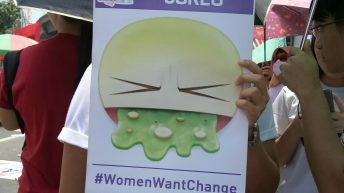 After forming Imaset, the women worked to establish a network of broad supporters to the call to save the Quezon and Rizal river and the Sierra Madre. In the first week of October, they formed such a network from a college in Metro Manila. They also launched their new song, another contribution on top of another Dumagat song popularized in the Laiban dam struggle since the 80s. At the launch of Network Opposed to New Centennial Water Source Project, women and other supporters mark their vow to oppose the new dam projects. What is remarkable among the Dumagat is their affinity to music and dance. On the day they formed Imaset, their workshop produced the text to a new song also entitled “Imaset.” Supportive priest Alex Bercasio composed the music to accompany the text and in playing it with the Dumagat, the community singing invariably led to the Imaset dance. The Imaset theme song is now being introduced to urban listeners and supporters as one of the songs of a group called Reds Pangkat Sining. The name is newly coined, but the priests and other musicians comprising it have long been supportive of the Dumagat’s struggle. Here is a version of Un Potok on Youtube, as recorded by the Talahib People’s Music. “Un Potok” (The Land) is a song on the indigenous Dumagat praying to their god, Makijapat, asking why the natural resources and the fertile lands are to be submerged and taken away from the people just for the profit of a few, and why the lush forest had to be denuded. Written by Fr Oliver Castor in 1985 and revised up to 1989, it’s been a unifying song whenever the Dumagat and supporters for the defense of Sierra Madre and the environment were gathered. For years, only the Dumagat knew the song “Un Potok” was his composition. 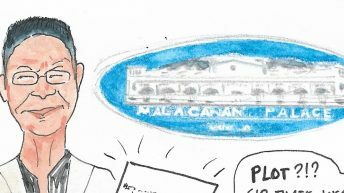 With the Duterte government’s drive to revive the dam projects, Un Potok reverberates once more, and Fr Castor has amped up also the way they sing Un Potok. Now, add to Un Potok is Imaset, their latest crowd-drawing Dumagat song for unity. 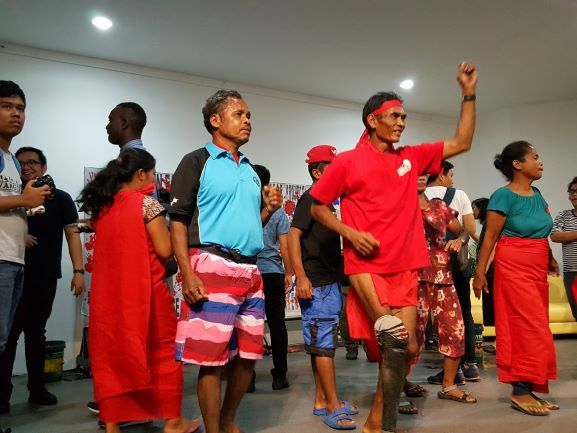 It is encouraging friends and allies to the dance floor, to join the Dumagat and other indigenous peoples in various gatherings. The Dumagat especially the women first sang together the Imaset during the solidarity night and bonfire of the Dumagat women’s assembly. They made a circle and declared their unity through the song. Dancing to the Imaset as allies imprint with their hands their calls of No to NCWS Project. Now that song is the Imaset’s way also of capping a day or a program of gathering with increasing number of supporters. 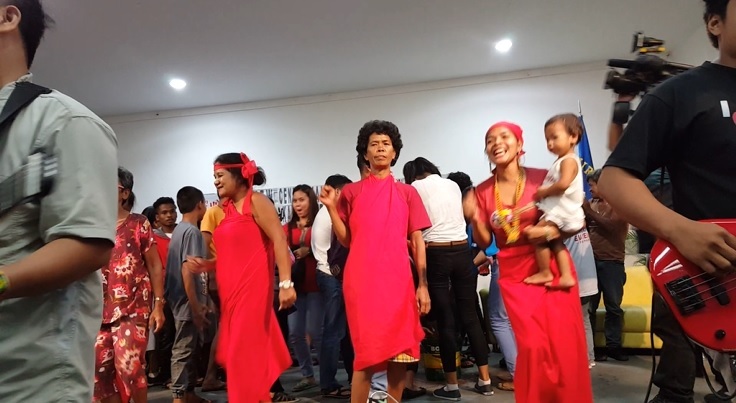 Be they part of the Kadumagetan or allies supporting the calls to save the soil, water and natural resources of Sierra Madre, they sing and dance it together in an ever-widening circle of prayerful activist.